Thank you for visiting our website. 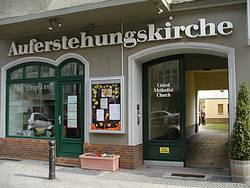 We are a small English-speaking international Methodist congregation. Our worship services begin at 5.15 pm* every Sunday with fifteen minutes of praise singing led by our worship team. Following the service we meet in the "Drop Inn" for fellowship over a cup of coffee or tea with a little snack. We hope you will visit us when you are in Berlin and make us your spiritual home if you stay! Remain blessed in the Lord!